Our program is designed to build confidence, teach kids how to responsibly care for animals, inspire empathy and learn more about animals in general. Camps are limited this winter and will fill up fast. Sign up today! Our Winter Break camp is run just a tad different than summer camp. 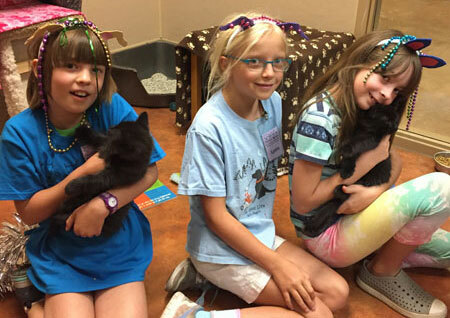 Because of busy camper lives during the holiday, we are offering individual ½ day camps instead of a week-long camp. This JANUARY, you have a choice of two days. Camp is for youth, ages 9-12. A light snack is provided around 10am and campers should bring an additional snack or lunch to enjoy during project time. 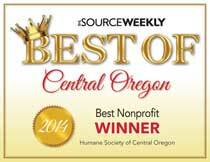 Camps are held on the campus of the Humane Society of Central Oregon’s Shelter; 61170 SE 27th Street, Bend, OR. Activities will move about the Shelter and be held both indoors and potentially outdoors. During winter break, campers should come prepared for light outdoor activity (ie, dog walking), including a coat, hat and mittens if desired. Registrations are limited and accepted on a first come-first served basis with payment included. Cancellations made more than 6 weeks before camp starts are entitled to a full refund minus $25 cancellation fee. Cancellations made 4-6 weeks before camp starts are entitled to a 50% refund. Cancellations made within 4 weeks of camp starting are non-refundable. Refunds are not given for any period of absence from camp.